The Scoundrels are coming to Sydney! Dirty Rotten Scoundrels, the devilishly cheeky, fun-filled Broadway musical is coming to Australia, opening at Sydney’s Theatre Royal in October 2013 for a strictly limited season. Based on the 1988 film with music and lyrics by David Yazbek and book by Jeffrey Lane, Dirty Rotten Scoundrels centres on two con men on the French Riviera. The first is the suave, sophisticated and successful Lawrence Jameson, the other, a small-time crook named Freddy Benson. When Freddy threatens to expose Lawrence’s operation, Lawrence begrudgingly agrees to take him under his wing and tutor him in the ‘art of the con’. The pair join forces and successfully work the Riviera until Freddy, frustrated by his apprentice ‘monkey boy’ role abandons the partnership and starts to compete with Lawrence, it soon becoming apparent that the small French town of Beumont sur Mer isn’t big enough for the two of them. They agree on a bet, the first one to extract $50,000 from a young female ‘soap’ heiress, Christine Colgate wins and gets to stay, the other must leave town forever. A hilarious battle of “cons” ensues, that will keep audiences laughing, humming and guessing right to the end! Dirty Rotten Scoundrels was nominated for 11 Tony Awards, including Best Musical. It was originally directed by two-time Tony Award winner Jack O’Brien and choreographed by Tony Award-winner Jerry Mitchell. The 1988 film of Dirty Rotten Scoundrels was directed by Frank Oz, and starred Steve Martin and Michael Caine. This all new Australian production of Dirty Rotten Scoundrels will be directed by Roger Hodgman (Chitty Chitty Bang Bang, Grey Gardens, Sweeney Todd), and produced by James Anthony Productions. Casting and ticketing details will be announced soon. 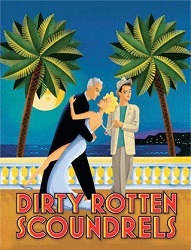 For more information, visit: www.dirtyrottenscoundrels.com.au for details.